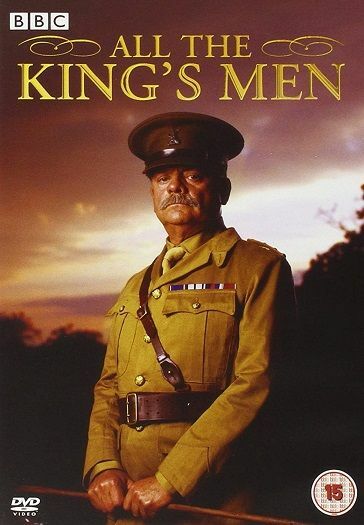 All the King's Men, was a feature length World War l Drama, first shown on BBC1, on November 14th (Remembrance Sunday) 1999, and starred David Jason, in the role of Captain Frank Beck, who led the Sandringham Company, which disappeared, in action, at Gallipoli, in 1915, the Sandringham Company, was made up of men, from the King's staff, at Sandringham House, Norfolk, Captain Frank Beck, was estate manager, at Sandringham House. Also among the cast of All the King's Men, were Maggie Smith (Queen Alexandra), David Troughton (King George V), William Ash (Sergeant Ted Grimes), Tom Burke (Private Chad Batterbee) and Patrick Malahide (Captain Claude Howlett). A lot of All the King's Men, was filmed on location, in Norfolk, Andalucia, Spain, represented Gallipoli. I have seen All the King's Men, only once (a repeat viewing). Below, you can see the DVD cover, for All the King's Men. This often turns up on the UK satellite channel 'Yesterday' - I have had this for a while but have still yet to have watched it. David Jason talks about this being very moving story in a documentary I saw him about him recently. I must get around to watching this soon.